The inventor of gastronomical boogie woogie. ONE MORNING IN THE EARLY 70'S, THE SAUCE BOSS WALKED OUT OF HIS HOUSE AND FOUND A 1933 VINTAGE NATIONAL STEEL GUITAR in his front yard. That lead him down the Blues path. Deep in the shed, he penned “Let the Big Dog Eat”, which was featured in Jonathan Demme’s film “Something Wild”. Years later he combined his blues with his hot sauce in a big pot of gumbo, made right on stage. Singing the recipe, he mixed his music and cooking together into a new medium. SINCE 1990, THE SAUCE BOSS HAS FED OVER 148,000 PEOPLE, ALL FOR FREE while he playing his own swampy Florida blues. A Sauce Boss event transcends performance. It's a soul-shouting picnic of rock & roll brotherhood, involving everyone. And at the end of the show, everyone eats. 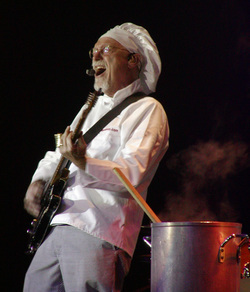 JIMMY BUFFETT SINGS ABOUT THE SAUCE BOSS in his "I Will Play for Gumbo" song. Parrotheads are now phlocking from all over the country and are also bringing the Sauce Boss to "play' and a' sway' with the gumbo" at their events.